What's colder than ice cream? Why, ice. So what better way to cool down this summer than some shaved ice (or shaved "snow")? Los Angeles, being as diverse as it is, offers many ethnic options for shaved ice, from Korean to Oaxacan to Indonesian. Perhaps one of the simplest, Hawaiian shaved ice is typically topped only with flavored syrup (though of course what's to stop you from adding more toppings?). Unlike most others which actually use crushed ice, this style of shaved ice uses a machine which literally shaves the ice, generating a much smoother texture. The most popular spot right now is probably Get Shaved, which has a storefront in Northridge and a truck that roams around the greater LA area. 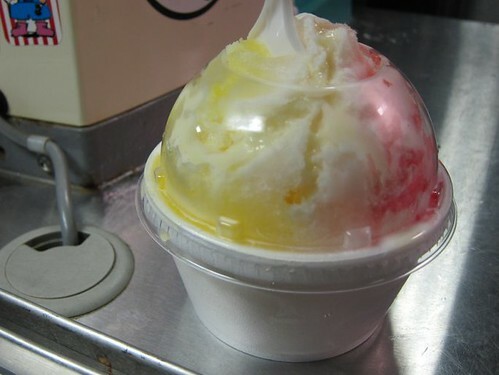 You can find syrup flavored with mango, lychee, passionfruit, all the way to bubblegum here and you can also add a scoop of ice cream below your shaved ice and top it all with red beans, condensed milk, and mochi balls. One of the best pat bing su in town can be found at Chego, although it is a rotating menu item so you may not necessarily find it when you go there. 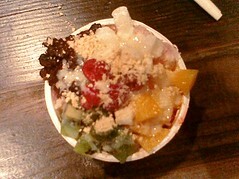 Here the shaved ice is topped with chewy mochi, red bean, mangoes, kiwi, and a red syrup. The flavors of all the ingredients here work better than many pat bing su concoctions. If you see it on the menu this summer, you might want to give it a try. 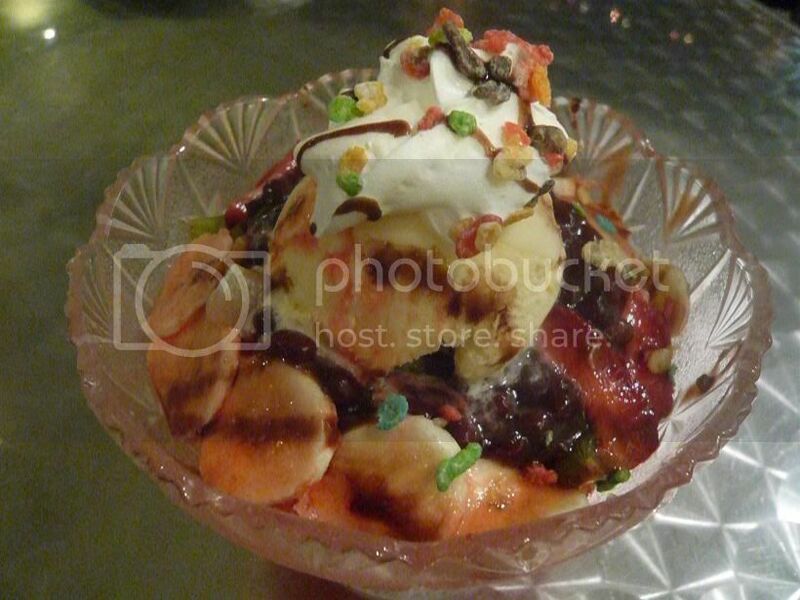 Ice Kiss is a popular cafe in Koreatown for their shaved ice. Size and visual matters here where you can get the largest serving served to you in a dogbowl. All the fruit and red bean are further topped with ice cream and whipped cream, which can be overkill, but they're open late and you can be sure there'll be enough for everyone. While the Koreans put all the toppings on top of their shaved ice, the Taiwanese style covers the bottom of the bowl with items of your choice including lychee, pudding, peanuts, red bean, etc and then top it with a tall pile of ice and condensed milk. Two popular places are Kang Kang food court where you can choose your toppings from the deli case, and Sin Ba La, a popular Taiwanese joint. 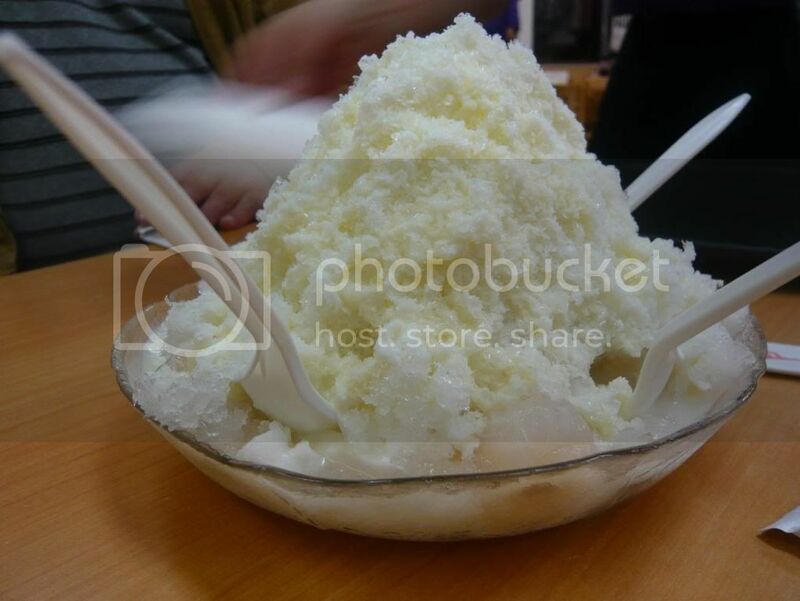 Shaved snow is pretty rare even in the San Gabriel Valley and the reputed best version outside of Taiwan is the one at Class 302 in Rowland Heights. The difference? 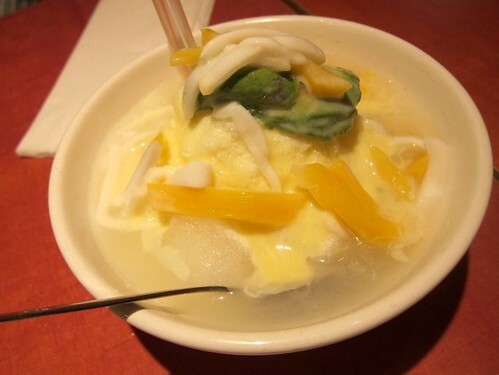 The "snow" is flavored and milk is added prior to shaving and (according to Kung Food Panda) it is shaved with a special machine, generating smooth ribbons of creamy "ice". I suspect this special machine is similar to the one used for Hawaiian shaved ice. The texture is closer to an ice cream and chunks of crushed ice. Their most popular is the mango but it tends to run out, so either try to go early or just order one of their other flavors such as green tea topped with red bean and mochi balls, or the caramel pudding. 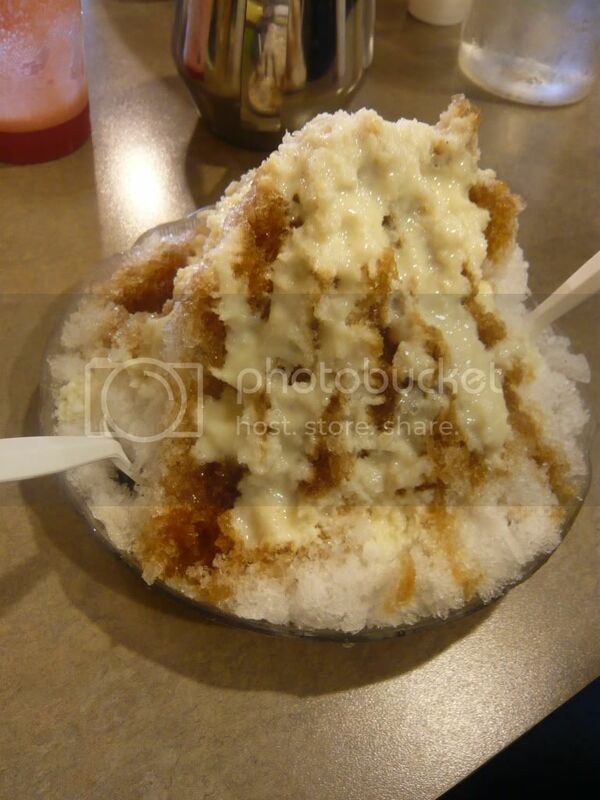 And yes, the milk-added-shaved snow is still topped with condensed milk. At the newly opened Natura Bar, you can get Oaxacan-style shaved ice, raspado, with exotic flavors such as tamarind, guayabana to more familiar flavors such as walnut and eggnog. A small raspado is a big cup filled with the syrup and chunks of fruits/nuts of your flavor both at the bottom and the top for uniform flavoring. In Indonesia even shaved ice can be considered a mid-meal drink. "Es Teler" (semi-literally, drunken ice) is a popular drink in Indonesia that utilizes tropical fruits and topping. Lucky for Angelenos, a version of it can be found at Simpang Asia. The shaved ice is topped with condensed milk and slices of coconut, jackfruit, and avocado. You can either eat it with a spoon or mix everything and drink it through the big straw! And the only photo I have of it was of the giant bowl next to my friend's face for size comparison! Great roundup! So much to try before summer's end!!! Three years ago a good friend of mine told me shaved ice was going to be the next big thing. I didn't believe him. Until now. great round up -- but jeez, I think I got a brain freeze just reading all that and look at the photos! What a great roundup and explanation. I love how you distinguished between traditional Taiwanese shaved ice and the Taiwanese snow ice. Pa Pa Walk's snow isn't as good as 302, but I guess it's definitely closer for me :P Pa Pa Walk's Mango Shaved Ice is definitely the better choice there. Maybe Mel, maybe Scott. Depends. Y'all left out Halo Halo! You have a shaved ice section! I LOVE frosty treats. Thank you. Fun round-up. I didn't know Chego offers shaved ice.